DECEMBER 2007 -- Now that State Session has been held, we should all inform the general public what your Granges have been doing the past year. It is very important that we keep the name of the Grange before the eyes of the general public. 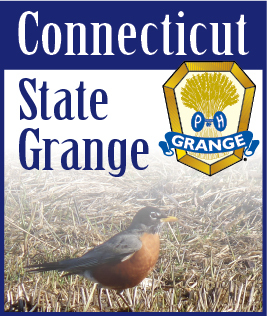 It is one of the goals of the State Grange to have a gain in membership. By keeping the residence of your town informed of your community service work, we hope that they may become interested in helping in your service to your community. From there, we hope that they may become members. We had numerous entries in this contest and we had a difficult time determining the winners. This year we did not have a Scrapbook Contest. Since there was a misprint in the Blue Book, the Committee decided to give a Special Award for the best Scrapbook. That award goes to Granby Grange #5. We also received many other entries which could not be classified as Best Single Article. Among this material were Fair Premium Books from Granges that sponsor Fairs, a Town's Annual Report with the Grange emblem on the cover as well as photos of their Grange activities, plus a Newsletter that is sent out to their members. The committee decided to make a Special Award to Old Lyme Grange for their Newsletter. The Committee decided to continue with the Best Single Article Contest. In addition, we have added a Poster Contest with two categories, Hand Drawn and Computer Drawn. The posters submitted should advertise a Special Event that is being sponsored by your Grange. The judging of the Poster Contest will be at the Let's Celebrate event on July 26th, 2008.